Three little-known trails run alongside these lakes, rivers and streams. A man fishes at intersection of the Ohio River and the Blue River at the Ohio River Bluff Trail. Courtesy of Steve Higgs. 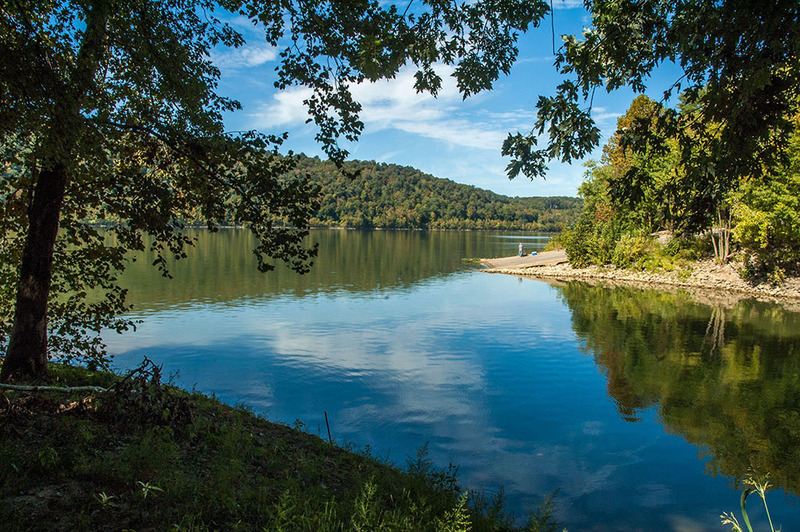 The hills of Southern Indiana are home to hiking trails, rivers, streams and lakes, and when combined, it’s worth the drive to see. Steve Higgs leads ecotours through Natural Bloomington and is an avid Southern Indiana photographer and author. He recommended these waterside wonders, and I set out to experience them. Whether you’re looking to trek alongside a winding creek or gaze upon a glimmering lake, these three trails will take your breath away. Features: Marshy land and openings where you can set up a tripod and camera. Finding the trailhead: You’ll see a large parking lot where boats are usually parked. Follow the small winding road that leads out of it. Take that road down to a smaller parking lot, and the old roadbed will begin there. Special note: Crooked Creek tends to flood during the winter. Features: A small cave just around the bend of Springs Valley Lake. Finding the trailhead: The coordinates will bring you to a small campsite with parking. The trailhead starts on the left of the site along the lake. Features: A view of the Ohio River along the entire trail and a nice picnic area at the trailhead overlooking the river. The trail ends at the Blue River. Finding the trailhead: Once you enter the park, take that road all the way to the Ohio River. The trail is on the far side of the parking lot at the end of the road.